“Nam Jai” (which literally means water of the heart) is very important for Thai people. When Thai people say that a person has “nam jai,” it means that this person is happy to make sacrifices for friends and extend hospitality to strangers.PLEASE JOIN US FOR A BELATED LOY KRATHONG NIGHT TO SHOW LOVE & SUPPORT FOR OUR FRIENDS IN THAILAND! As most of you are aware, Thailand has recently experienced the worst floods in half a century. About 8.2 million people have been affected by the flooding and economic losses are so far estimated at $3 billion. Google will generously match donations up to $6,000 – so please tell your friends about the event. Proceeds will go to Red Cross Thailand who are currently providing victims with flood kits and hot meals. This will be a fun filled night with entertainment and we will be raffling off some great prizes to help the cause! 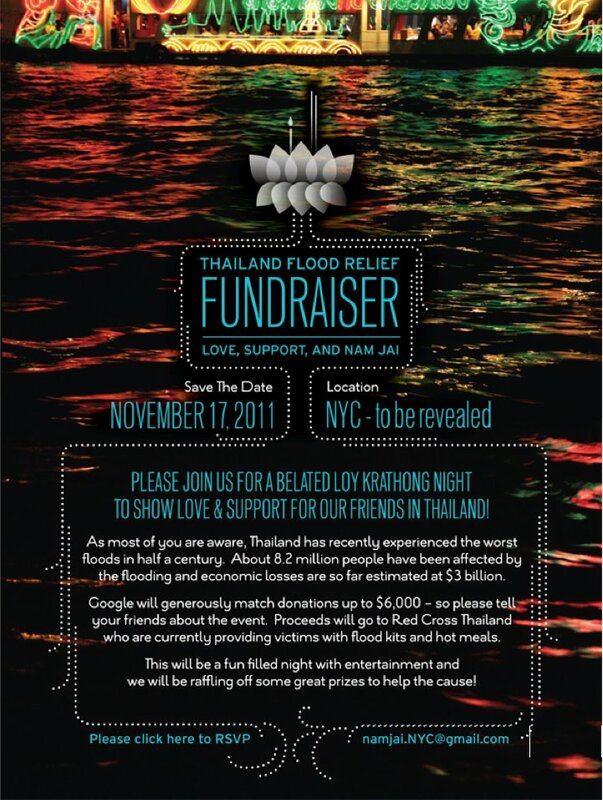 No user commented in " Thailand Flood Relief Fundraiser "